Personalization of Government to Business portals is often seen as the silver bullet in building and managing the relationship with business owners and start-ups. Its natural for government to gravitate towards personalized portals when there are plenty of businesses in their jurisdiction and their digital expectations grow to demand a personal end-to-end experience online. There’s no magic number for when this happens. It could be when the overall population reaches 100,000 or it may not happen until half a million. At this point the size of the business population and its consumer base is sufficiently large to be digitally engaged and ready to move from face-to-face to online self service. There are plenty of resources online to help guide larger governments deliver personalized experiences online. But smaller governments and cities are often left with nothing. This article addresses this. You can - and in fact should - rely on the strength of personal relationships to encourage businesses to start and grow. All while transitioning them to the digital economy. 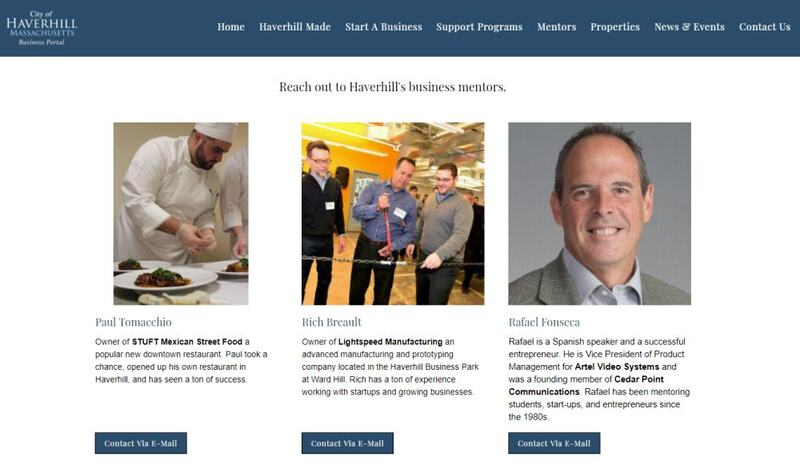 This week I’d like to highlight the City of Haverhill’s Business Portal - a great digital experience delivered by a Massachusetts city with only around 60,000 people. 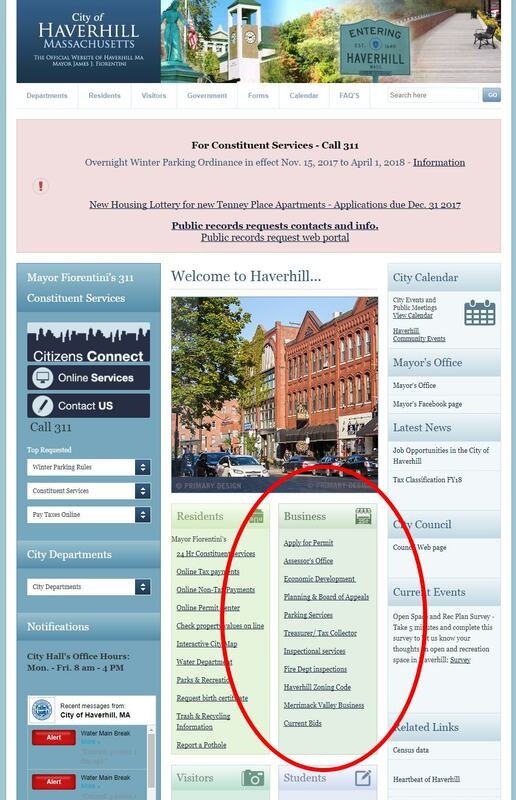 The Haverhill Business Portal strikes the ideal balance for smaller local and municipal governments to emulate. It weaves together online an engaging experience for business start-ups, creating the right connections with city officials at the right time. There are a number of great foundational elements that all customer-focused Government to Business portals increasingly have. But what helps Haverhill stand out is its own unique local flavor. Customer-focused journeys for starting a business that take start-ups on a linear step by step process. If that’s not enough check out their videos. Haverhill literally have their key municipal officials delivering brief video walk-throughs for new business owners. Sure they’re not going to be winning any Academy Awards for their acting abilities, but what you want from city government are the facts delivered succinctly and accurately. Over and above having their email details the videos also include phone numbers and opening hours if you have any questions. The local personal nature used by Haverhill just works. It’s not kitschy or disingenuous. It’s up front, honest and 100% helpful. Of course some aspects of delivery such as Haverhill having an in-house/community TV team massively helps. But having a digital video component of the site is just a pillar supported by the portal’s foundation of personal connectedness. So it shouldn’t be discounted as an aspect of delivery that would prevent many other governments replicating the successes of Haverhill’s Business Portal. By shining a light on the great things achieved by Haverhill it’s essential to also recognize where they can improve. This not only provides them with an independent assessment, but it also helps you and your government organization improve so you can better support local businesses in your jurisdiction. Many business development government organizations often have staff inefficiently allocated to servicing “tyre kickers”: individuals who dream of being a business owner but never follow through with actions. Building into the portal a diagnostic tool or other means to triage away tyre-kickers could allow better use of skilled government officials to focus on providing even better face-to-face customer service to committed business intenders and owners. By having a broader and deeper digital content offering Haverhill Business Portal is also then more likely to appear more highly in Google search engine positioning and ranking. Which means more local businesses discovering the support and services offered by Haverhill, further powering economic development and job creation. While the testimonials are aimed at attracting businesses to Haverhill, the site’s customer proposition is more around business intenders already living in the city. The portal should build a more compelling section of the site about relocating your established growing business to Haverhill. 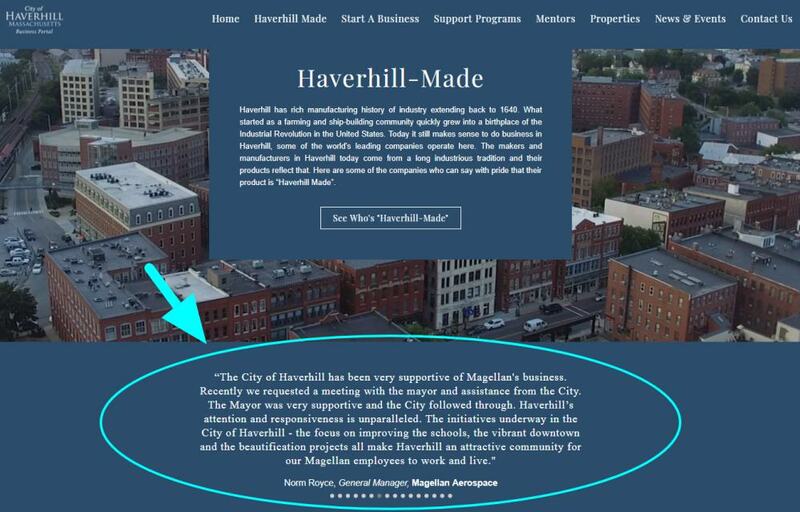 One of the big missed opportunities is the lack of connectivity and links between the City of Haverhill website and the Haverhill Business Portal and vice versa. Not only does the City’s homepage bury business services in the screen real estate, but it doesn’t link at all to the business portal. Only the economic development section of the site (which manages the business portal) links to it. And the business services on the City homepage aren’t on the business portal. This seems to be a result of the Business Portal only going live last week and perhaps with the holiday period it hasn’t been possible to create the connections needed to draw together the two sites to mutually support each other better. Assistant Director Robertson has said this is something they are working on. So it’s good to hear that this will be addressed shortly. 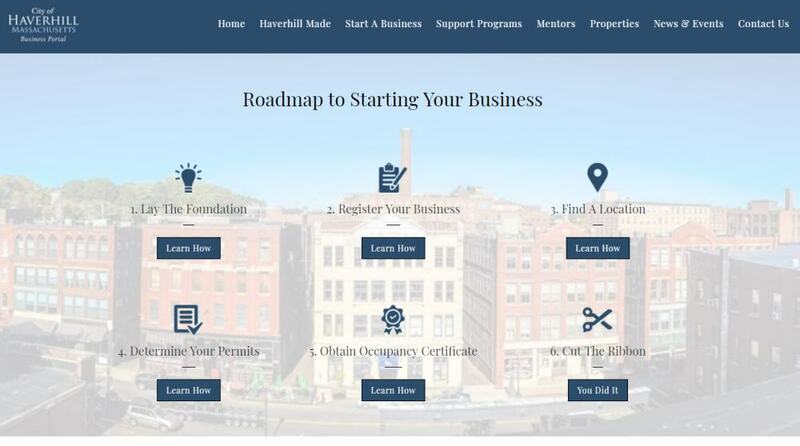 Largely as a result of the lack of linking from the City of Haverhill’s website, the decision to run the business portal on its own .com domain instead of a government domain and its newness, the business portal lacks the presence on Google it should deserve. Both of these issues should be addressed early on to ensure the Haverhill Business Portal and its service offerings can be better discovered. So while there are areas Haverhill and its Business Portal can improve, its overall focus on good old fashioned local connectedness is a breath of fresh air. 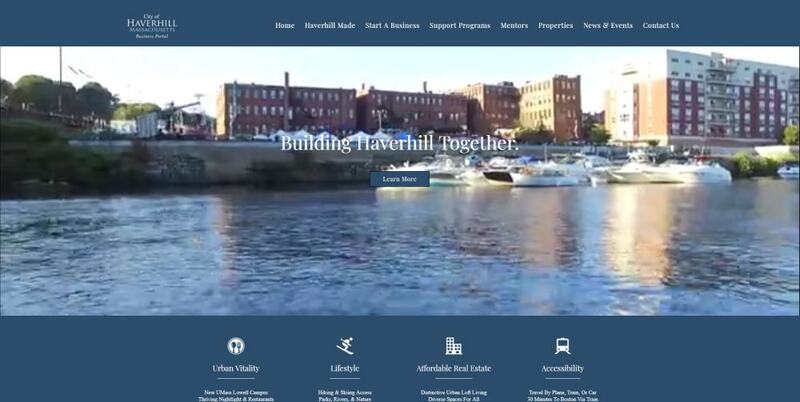 If you’re leading a smaller municipal website for business - or even a larger Government to Business portal - you can learn a lot from the great work done by Haverhill. And based on their plans to address some of the issues in this article, they will only get better.